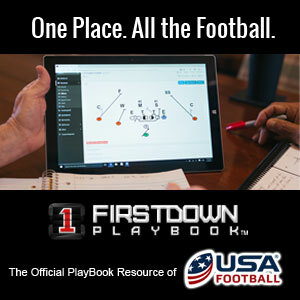 As FirstDown PlayBook continues to expand your youth football offensive section you may have noticed that as we add more formations it affects the defense that we draw up for each and every one. We continue to predominately set the front to the formation and play cover one (man coverage) behind it. We do this because we don’t feel like two deep safeties or zone defense, for that matter, has much merit in youth football. As you take a closer look at the twelve different FirstDown PlayBook youth football offenses you will still notice differences as we adjust the 6-2, 4-4, 4-4 Split, 5-3, 5-2 and 5-3 Bear defenses to the formations. Not that FirstDown PlayBook knows how every youth football coach is going to adjust to every formation but we make what we call a “common sense adjustment”. Most of the time, the adjustment is made because in our estimation if the defense does not adjust they are really leaving themselves exposed somewhere. If the defense you are playing does not adjust to your formations, you can bet that there is a play or…ten that can hurt that defense because they are short in some area. There is one other thing to think about as you see the defensive adjustments to your youth football plays. When you draw all of the plays up against multiple defenses like we just described, then you have to understand that some plays just don’t draw up well against every defense. So as a youth coach you need to take a hard look at what defense you are playing that week even after you choose your formations and plays. This will make a big difference as you formulate your weekly game plan.